Pro-Line is proud to introduce our next generation of Rock Crawling Performance Foam Inserts: the all-new 2.2� Dual Stage Closed Cell Inner/Soft Outer Foam! Pro-Line�s new inner inserts are made from lightweight and waterproof Blue Closed Cell Foam while the outer is made from Soft open cell foam. When combined they are perfectly sized for Pro-Line�s 2.2� XL sized Rock Crawling Tires. 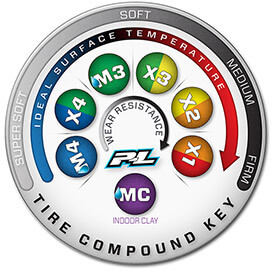 The inner Closed Cell inserts are completely contoured to correctly match the shape of Pro-Line�s tires for improved tire performance and appearance. The Soft outer foam provides maximum grip while maintaining a fully supported sidewall from the inner Closed Cell foam for maximum side-hilling performance. Pro-Line�s new Dual Stage Closed Cell foams are extremely durable and will last through many rugged adventures. Get your own set of Pro-Line�s new Rock Crawling Dual Stage Closed Cell Foam Inserts today!